Mobile mixer trucks are cost effective and efficient. Only company in NJ with a truck that comes to YOU! You only pay for what you need vs paying for what you think you'll need. Quality 1st Concrete is a concrete or cement supply company in Monmouth County, New Jersey. We use specialized Mobile Mixer trucks for your fresh, concrete mix on every delivery we make. Quality 1st Concrete has over 20 years of experience, so you know you're in good hands when you order from us. We service over 1,000 customers a year at Quality 1st Concrete so you know you're hiring a company with experience and concrete expertise. You only pay for what you use with Mobile Mix Concrete Trucks versus Barrel Trucks where you pay for what you think you'll need. We are the only company in NJ with a truck that comes to you, to make the job better quality and more convenient for you. 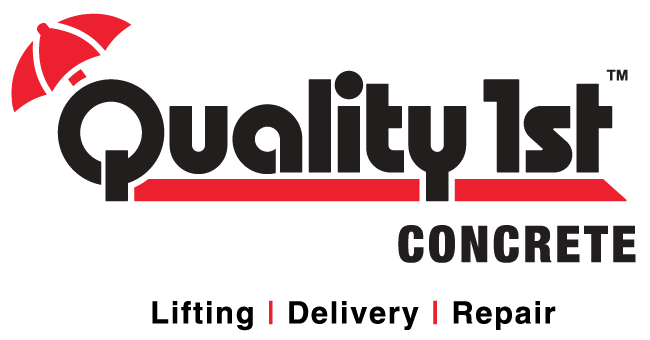 At Quality 1st Concrete, no delivery is too small or large so call us for your Union, Somerset, Middlesex, Monmouth County concrete delivery today! To find out how many cubic yards of mixed concrete we will need to deliver to your construction site, simply enter in the width and length in feet and height in inches into the concrete calculator. We can tell you exactly how many cubic yards our Mobile Mixer Concrete Truck will be transporting for you. Just contact us with what you need and we will estimate the price for a concrete delivery. No one else in New Jersey can offer you what we provide in concrete services and supplies. Call us today for fast, professional cement service! Our employees attended and were certified in concrete training in Pennsylvania. The training was run by the company that makes our specialized mobile mixer concrete trucks, Zimmerman Industries. Our employees were certified in the subjects of: the science of concrete, concrete testing, maintenance and operation volumetric mobile mixer, unit calibration, concrete aggregates, concrete finishing, varied weather concrete production, and specialty concretes. They also learned the ins and outs of our trucks and how to calibrate the volumetric mixer. We Excel under pressure! Quality 1st Concrete has been serving New Jersey since 1986 as a home improvement contractor.